I have rejoined the company for the Winter Season run of Sleeping Beauty. Actually, I made a handful of appearances as Frau Stahlbaum during the last two weeks of the Nutcracker; but since I didn’t even have a rehearsal for those shows it felt like I was moonlighting. 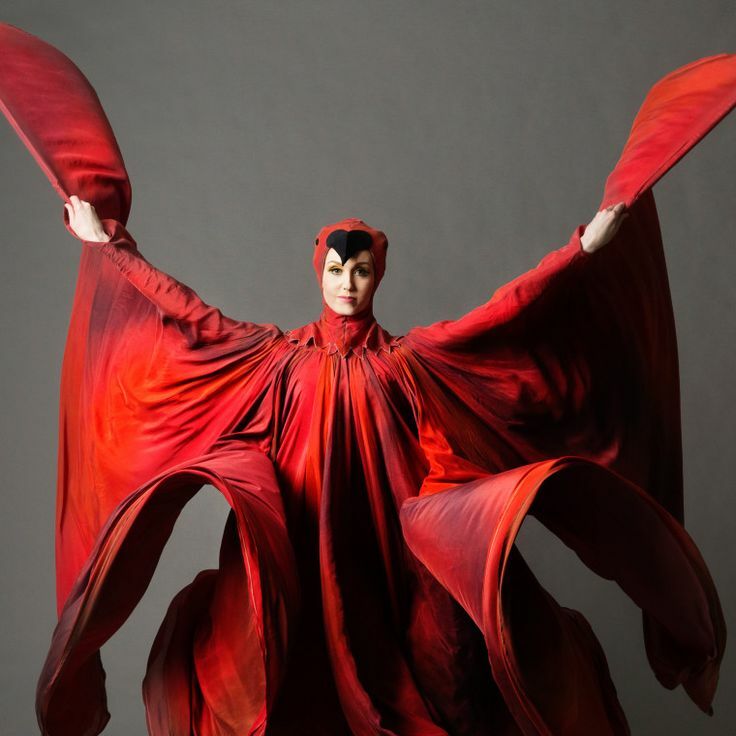 Now, even though I’m just doing two acting roles, I’m back to days of long dress rehearsals and a maternal debut: as the Queen, my ninth role in Peter Martins’s Beauty production. 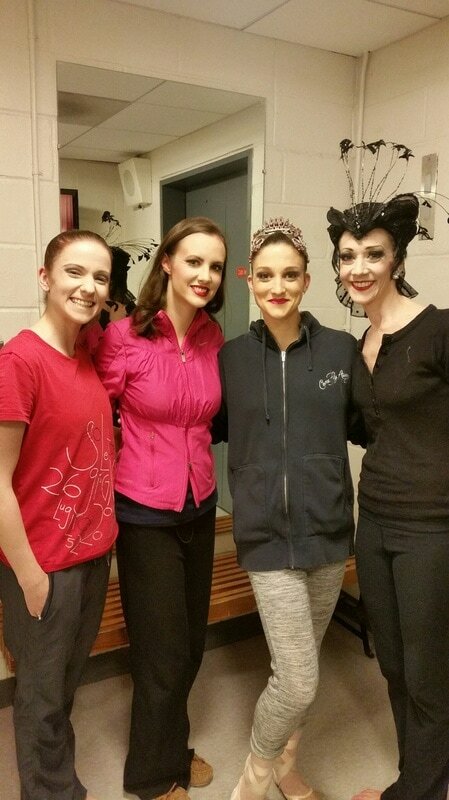 Coincidentally, all of the ballet moms were on in last night’s cast so it was a special show! With Rebecca Krohn, in character! Today was a dark and dreary day in NYC, on what seems like a dark and dreary day for womankind. I decided it’s time for me to write about my son’s birth story and the awesome power of the female body. Every mother I know told me that my delivery would not go as I planned it; boy were they right. First of all, I did not anticipate going two full weeks past my due date. The waiting was torture, as was the extra pound my son put on in that time, even though I did put on that much weight overall. Babies gain rapidly at the end. My lower back was killing me, even rolling over in bed was a chore. Ten months of pregnancy is no joke, and I was beginning to despair that he would never come. I tried everything in the homeopathic playbook to get him to come out so that I would not be chemically induced: I had my membranes swept, I went to acupuncture daily, used a moxibustion stick, drank some awful mugwort concoction from a Chinese practitioner on Canal Street, and consumed copious amounts of red raspberry leaf tea. I attempted the old wives’ tricks too: I sipped Guinness beer, champagne, ate spicy curries, and drove down bumpy Joralemon Street in our shock-exacerbating Smart Car. Being overly-pregnant had become a full-time job, as I had to go in for testing at the hospital every few days to make sure my baby had enough amniotic fluid and that his heart rate was normal. Apparently my womb was too cozy a place, for the doctors told me that he was getting big but they wouldn’t induce me until 42 weeks. I had planned for as natural a birth as possible at the Mt. Sinai West Birthing Center, but the cutoff for eligibility is 41 weeks and 6 days. On exactly the last day of that window I finally went into real labor. 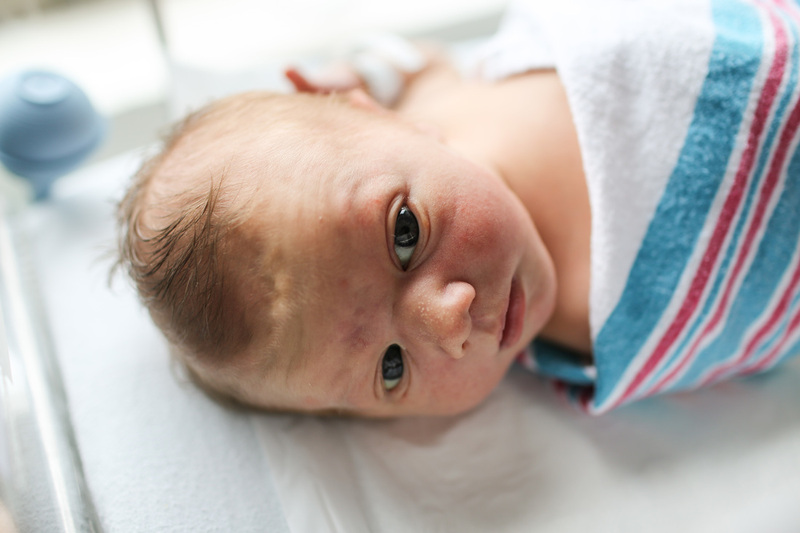 At 2:30 am the night before his birth my contractions began randomly but in earnest—sometimes 40 minutes apart, sometimes 20—but they were completely manageable for the whole next day. They were more intense than the Braxton-Hicks practice contractions, but they didn’t bother me much. I made my partner go in to work the next morning, and I relaxed and drank water and tidied up the house. When my partner got home from work early that evening my contractions were about fifteen minutes apart, but they still weren’t painful. We took a long walk and I ate some scrambled eggs and toast at around 7:30pm. My contractions started to quicken to 7 minutes apart at 8:30 and I called the midwife. Neither one really believed that I was in active labor because I didn’t “sound” distressed enough. My wonderful doula, Ash, came over at 9:40, and just as she arrived my water broke. She confirmed that I was indeed in active labor and we called the midwife and the hospital to prepare the Birthing Center—it looked like I would just make the cutoff. The rupture of the amniotic sack was such an odd sensation. I heard a pop and then felt a trickle of fluid. 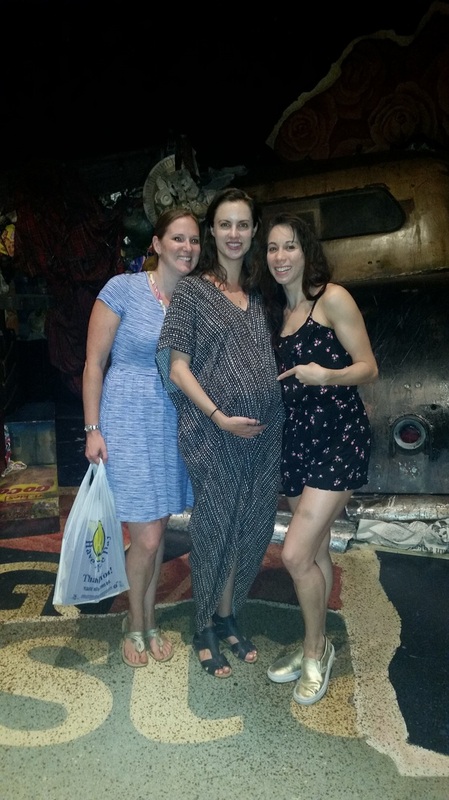 It was a painless event, but after my water broke my labor became increasingly painful. Each time I moved there was more fluid and my contractions went to three minutes apart. What followed was the worst Uber ride of my life—even though the driver was a saint and avoided every pothole and hard stop. ​By the time I arrived at the hospital I was 9 cm dilated and almost ready to push. But there was a complication. Two weeks ago today I gave birth to a baby boy, Rhett. I cannot believe how the time has flown by already, but I promise to post about the birth experience in the near future. (Like when I get some sleep, ha!) This has been the most intense, wonderful time! Fall is my favorite time of the year. I am thrilled that the temperature is leveling off and the mums and squashes have begun to appear on the neighborhood stoops. It is always an invigorating time in New York, as it is the start of so many cultural seasons. Mercifully for me, it also marks the start of football season, which has been a necessary distraction as I eagerly await the birth of my baby who is now past due! Perhaps he or she will come on the autumnal equinox? Though dance and football have not been sympatico so far this season (my beloved Antonio Brown was fined in the very first game for this​ end zone dance, which I may borrow as a labor position…), they have been foremost in my mind lately. For today is also the kickoff of the NYCB fall season, and I have been thinking of my colleagues. 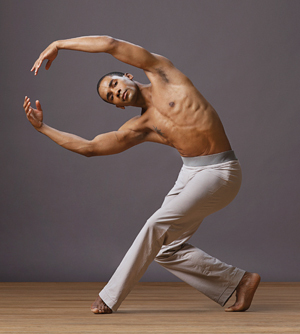 Tonight’s gala showcases four new ballets, two of which are by female choreographers—hallelujah! NYCB Principal Lauren Lovette and guest Annabelle Lopez Ochoa are the debuting duo. There is also a new offering from resident choreographer Justin Peck and one from the young corps member Peter Walker, who is an excellent partner and a genuinely nice guy. I wish them all the best of luck this evening. But as the season begins I want to acknowledge a slew of retirements that happened at the end of the summer. Three lovely young women, Dana Jacobson, Lara Tong, and Stephanie Chrosniak, have moved on to other pursuits. I have no doubt they will find success in their next endeavors. Senior corps men Joshua Thew and David Prottas have also left the company. Josh, who is an amazing singer, is going to devote more time to this other skill as well as model. David is joining the touring company of An American in Paris. I danced my last show before maternity leave with David, he has been a wonderful partner over the years. They will all be missed. Especially transformational for the company is the loss of two dancers who had been around for almost two decades: Craig Hall and Gwyneth Muller. I attended their final performances on back to back evenings in Saratoga Springs this summer, and it was such a moving experience. 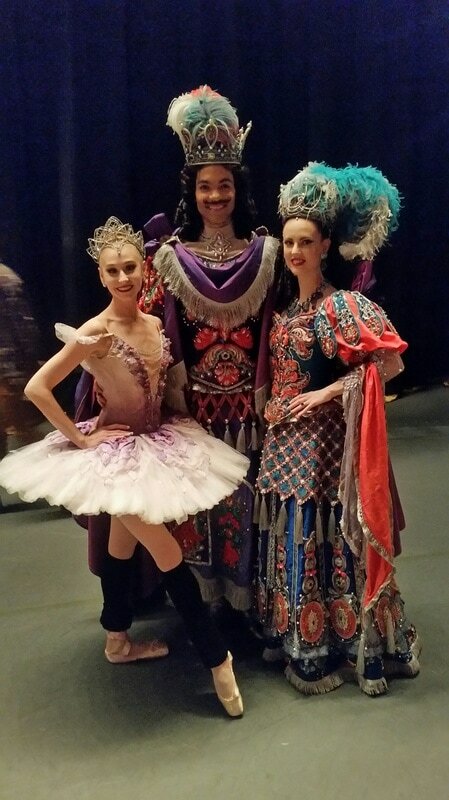 Craig wrapped up his performing tenure with the Concerto section of Balanchine’s Episodes. His handsome calmness and phenomenal partnering skills were on fine display. I liked that he went out in a quirky part too, for Craig is also a total goofball and the role’s swings between seriousness and playfulness suited him perfectly. Gwyneth danced her last Serenade the following night. There is no more fitting retirement vehicle than Serenade, Balanchine’s masterpiece of life, death, and rebirth. Gwyneth, who has never given less than one hundred percent of her energy onstage, looked especially radiant in her final evening of swooshing blue tulle. Her last incarnation as the “mother” figure in the elegy section was intensely emotional. These incredible artists have been my close friends since our early days at the School of American Ballet, and their professionalism and positivity have made them pillars of the NYCB community. Craig, with whom I have a lifelong bond from our intense early experience of dancing in Chris Wheeldon’s Scènes de Ballet, is staying with the company as a ballet master. Gwyneth, who has been a dear friend of mine through high school, undergrad, and ballet life, just kicked off her first semester at Yale in a prestigious arts administration program. I am sure that Craig and Gwyneth will be as prosperous in their new roles as they were in their dancing careers and I am so very proud of them. Cat person that I am, I had never seen Andrew Lloyd Webber’s musical Cats until this week. I have long been familiar with T.S. Eliot’s poems on which the show is based, and I knew some of the songs (“Memory,” bien sûr), but other than that I was a total newbie. My friend and NYCB colleague Georgina Pazcoguin stars as Victoria the white cat in the current Broadway revival, and it was wonderful to see her shine—glow, actually—in a new milieu. Cats and ballet make for good bedfellows, even outside of the pas de chat or “step of the cat.” George Balanchine is famous for his obsession with his cat Mourka’s leaps. And NYCB ballet mistress Rosemary Dunleavy is always reminding us to place our feet nimbly like cats, to work exaggeratedly through demi-pointe when we roll through our feet. She also encourages us to study our cats at home when she coaches the crawling around in the Arabian solo in The Nutcracker—and she often does this while wearing the iconic Cats on Broadway t-shirt for good measure! Perhaps this is why Gina looked as comfortable in the junkyard set as she does in her tutus. I found the show to be quite a hoot, which is not shocking given its jocular source material, but that aspect surprised me nonetheless. It is basically a jukebox musical of cat puns—there is not much in the way of plot or character development. In fact, the few through-lines the show has are its weakest links: Grizabella’s mysterious outsider status and fall from grace are relatively unexplained, making her reincarnation at the end feel hollow. I also wasn’t convinced by Leona Lewis’s portrayal of an old kitty. I know she is the headlining star in the show, but she looked like she was play-acting. Wouldn’t a respected Broadway elder have been a better fit? And the evil Macavity’s arrival is hyped often, yet the event itself underwhelms. He doesn’t even get a song. His catfight sequence seemed really weak after the foreshadowing number by the silky duo Madison Mitchell and Christine Cornish Smith as Demeter and Bombalurina. What was such great fun about the show was the sheer silliness of it, from the cats entering through the dark audience with glowing eyes in the opening, to the grooming orgies, and the oddly poised group recitations of Eliot’s goofy verse. And the show is jam-packed with impressive dancing. Almost all of the cast sings and dances the whole time—and they are clearly an extraordinarily talented ensemble. Gina, whose albino unitard makes her stand out in even the darkest scenes, was in constant motion for over two hours. She danced beautifully and her committed performance alone is (in my admittedly biased opinion) worth the price of a ticket! Since I am unfamiliar with the original choreography, I cannot comment too much on Andy Blankenbeuhler’s updates, but there were definitely some hip-hop accents that resembled his work in Hamilton. He also loves a slow, partnered lean-out arabesque. The dancing was really great throughout, and I couldn’t believe how well the performers were able to sing and enunciate while lifting each other, turning, and cartwheeling. Ricky Ubeda, as Mistoffelees, has the tour-de-force dance number of the production and he sailed through it. It contained a gauntlet of tricks: à la seconde pirouettes, coupés tombés jetés en tournant, etc. It reminded me of a Youth America Grand Prix solo, but with singing and a Siegfried and Roy light-up coat! Since I’m having frequent Braxton-Hicks contractions and back pain now, it was hard to sit comfortably, and the show felt overlong to me. But I think even if I wasn’t extremely pregnant a little editing would have gone a long way. Also, how can you revive a cat musical in 2016 without a single nod to the internet? There was no cat-breading or cat-sushi-ing, no cat-Nicholas Cages or Hello Kitties, etc., to be found. When one cat took a ride on a broom I wished it was on a Roomba. This Cats revival is a little too serious for its own good, it is begging for some sort of meta-nod to modern cat memes. Also, I’ve always had cats in my life, and cats are never that earnest. While Eliot’s poetry aptly describes many kinds of cats, (for example: my parents’ fat cat Giles was personified to a tee by Christopher Gurr as Bustopher Jones) I needed a little more cynicism to see the show as a proper feline tribute. The Cats cats perfectly embodied Eliot’s cat poems, yet for me to be convinced I needed to believe that they’d rather be contemplating his Four Quartets. 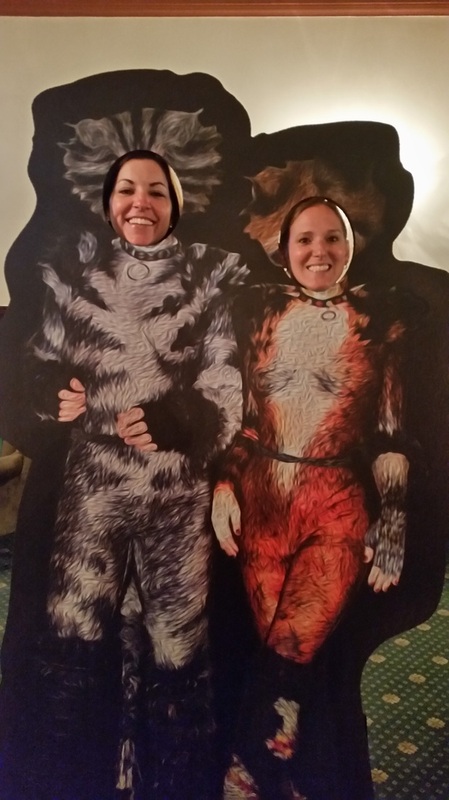 Last week I watched Stranger Things on Netflix, this week I saw Cats on Broadway with a group of friends I’ve known since I was a kid. The 80’s are having quite the renaissance. It is so surreal, on the cusp of motherhood, to be inundated with imagery from my own childhood!